For the digital designer or systems architect, the design of the board level power supply is typically done after the DSP, FPGA, Memory and Communications have been selected. It’s not uncommon for each of these devices to have multiple voltage requirements and its own dedicated power sub-system. This is in addition to the system level power supply or the isolated power supply to convert the AC line voltage. 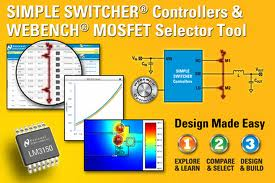 Fortunately, the IC suppliers have provided a number of free tools to help the designer create a complete power supply design. These tools use a step-by-step approach to reach a cost effective solution in a relatively short time. First, the designer enters the requirements for input voltage range, output voltage and output current. Additionally, parameters for operating temperature range, status outputs or multiple output voltages can be entered. Based on these requirements, the tool generates a complete power supply design with the regulator, switcher or module and the associated resistors, inductors and capacitors. Using drop-down menus, the designer can select different RLC manufacturers, values or configurations to customize the design. This allows complete flexibility to make trade-offs between performance, price and over-all footprint. The third step is to analyze the design. The designer can generate graphs showing key characteristics like duty cycle, efficiency, loop response and stability. Additional tools show thermal characteristics or power dissipation. At this stage of the design it’s easy to make changes and see the effects. For example, substitute two capacitors in parallel for a single capacitor and observe how this affects the ripple current. Results from each change can be saved and displayed simultaneously for comparisons. Now that the analysis is complete, it’s time to test out actual hardware. All of the tools produce schematics and an itemized bill of materials (BOM) that can be used to build a board. Some suppliers will ship in 24 hours all the components as well as a printed circuit board (PCB). Solder the components to the PCB and test out the design. Below are some of the suppliers offering free power-supply design tools. These sites also contain web-casts, tutorials and examples.